Welcome to the third installment of my Favourite Etsy Finds where I share some of the delightful creations that I’ve discovered on my journeys through the Etsy universe. As an Etsy seller myself I really appreciate the wide range of hand-made items you can find on this site and the opportunities it offers to makers such as myself. Read on for some of my latest favourites! The stunning ceramic creations of HeesooCeramics really take the craft to another level. Often featuring autumn coloured groves of silver birches and pale blue glazes that remind me of hidden sand-bottomed springs in, I would be terrified to own one of these pieces of art for fear of breaking it! PapioPress’s shop is chock full of gorgeous whimsical creations featuring their own unique patterns and style. Silver foxes romp through moonlit gardens, unicorns and cute sloths abound. 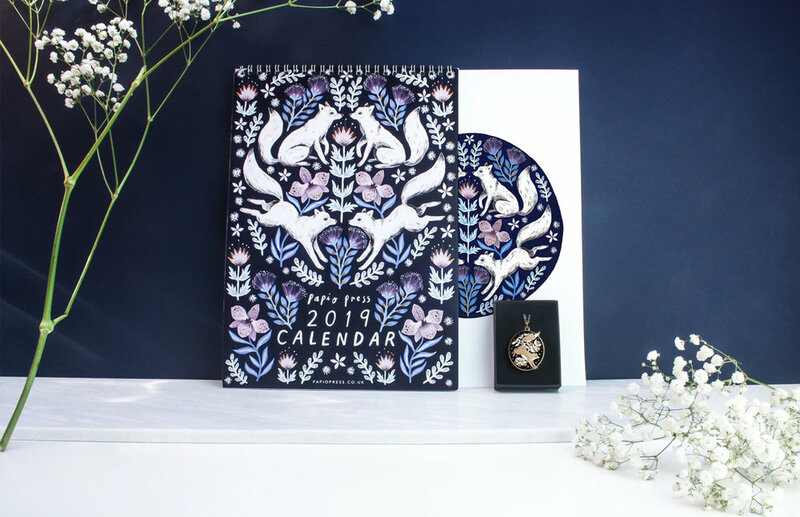 I recently purchased their 2019 calendar and I’m excited to enjoy their artwork through the year and then frame my favourite pieces! Anyone who knows me, knows I’m a sucker for jewellery. I recently discovered the cute jewellery creations of EEJewellery and more importantly this gorgeous set of necklace and earrings. I love that they aren’t matching earrings and living in rainy Wales, the rain cloud resonates with me! I’m in love with this whimsical, flat, floral trend that is happening at the moment and BritSketch does such a beautiful job of working with jewel tone colours in a flat graphic and dynamic style. I think I could buy one of everything in her shop! There’s just something about these charming felt critters by JacarandaTreeUK. It takes a lot of talent to create a creature that appears to have animation and a breath of life in it and this amazing maker has that skill nailed down. Her charming little felt mice are just delightful, with their beady eyes they make lovely little companions for the desk or bookshelves. That’s all for today! Be sure to follow my blog or sign up for my newsletter to see the next issue of my Favourite Etsy Finds!